This is a major study of economic policy making in Britain between the wars. It provided the first full-length analysis of the early development of fiscal policy as a tool of modern economic management. The central question addressed is how Keynesian fiscal policies came to be adopted by the British government, with particular attention paid to the role of the Treasury and to that of Keynes himself. 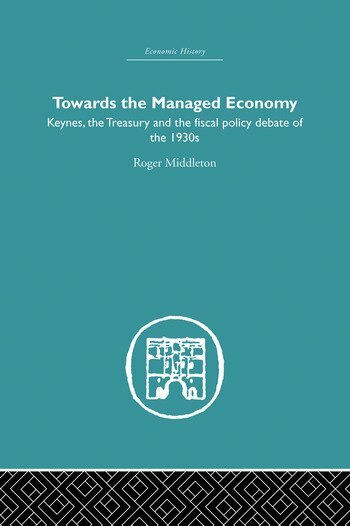 Drawing extensively on unpublished documents hitherto untapped by economists or historians, Roger Middleton challenges the widely held view of official economic thinking as an ill-informed group of people holding ‘the Treasury view’ in opposition to Keynes’s prescriptions for deficient demand and mass unemployment. Instead he argues that acceptance of Keynesian economics during the Second World War resulted from political and administrative factors as much as a conversion to Keynesian theory. He investigates the form and impact of fiscal policy during the 1930s and, through a constant employment budget analysis, shows convincingly that at times of rising unemployment governments ignore at their peril the effects of automatic stabilizers upon budgetary stability. Historians and economists welcomed this fresh perspective on a debate of historical as well as contemporary importance. Towards the Managed Economy is essential reading for all those interested in the rise and fall of Keynesian demand management. This classic text was first published in 1985.